The Assam Accord, 1985 was a Memorandum of Settlement (MoS) signed between representatives of the Government of India and the leaders of the Assam Movement in New Delhi on 15 August 1985. Because 2019 elections are approaching, the Assam Accord issue has been of a great interest in News channel debates recently. In this article we will have a look on this matter in detail. It was a popular movement led by All Assam Students' Union(AASU) and All Assam Gana Sangram Parishad(AAGSP) to expel illegal Bangladeshi immigrants and to protect & provide constitutional, legislative and administrative safeguards to indigenous Assamese people. In 1978, the MP of Mangaldoi Lok Sabha constituency, Mr Hiralal Patwari died due to which by-elections were needed to be held in that constituency. During elections, observers noticed a dramatic increase in the number of registered voters. A lot of illegal Bangladeshi immigrants had their names in the voting list. This led to the start of this movement. AASU demanded the elections to be postponed and the names of foreign nationals to be deleted from the voters list. Earlier it was a peaceful movement. The educational institutions were closed, government offices were picketed and no one was allowed to file nomination papers in the Brahmaputra valley. December 10, the last date to file nomination was declared a state-wide 'bandh'. Things changed when police force escorted Bagam Abida Ahmed to file nomination. Police attacked protesters and Kharageshwar Talukdar, 22 year old General Secretary of Barpeta AASU unit was beaten to death. This led to violence spread across Assam. On 18 February 1983, mob of Assamese people killed more than 2000 alleged illegal immigrants to death in 14 villages of the Nagaon district. This is known as Nellie Massacre. Because of all the violence spread in Assam, the government was forced to start finding ways to solve this issue. In October 1983, the Illegal Migrants-Determination by Tribunal (IM-DT) Act was passed by the parliament. 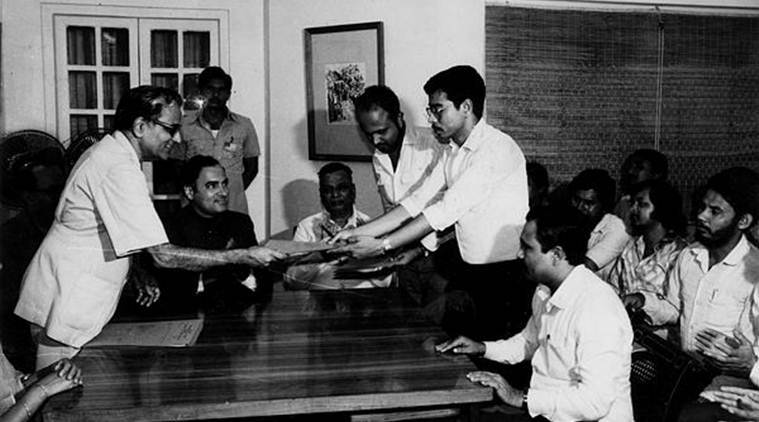 In May 1985, formal talks started between the Indian government and AASU-AAGSP. On August 15, 1985, The Assam Accord was signed marking the end of the movement. AASU and AAGSP also formed a political party together and won the state elections in 1985 and 1996. All people who came to Assam before January 1, 1966, would be given citizenship. Those who moved in between January 1, 1966, and March 24, 1971, would be “detected in accordance with the provisions of the Foreigners Act, 1946 and the Foreigners (Tribunals) Order 1964”. Their names would be deleted from the electoral rolls and they would remain disenfranchised for a period of 10 years. Also, “Foreigners who came to Assam on or after March 25, 1971, shall continue to be detected, deleted and practical steps shall be taken to expel such foreigners". The signing of the accord ensured that the agitation came to an end. But many clauses mentioned in it have not been implemented and that in turn has kept the issue burning till date. AASU is upset as many major issues are still unsolved. In 2017, a formal talk took place between Home Minister Rajnath Singh, Chief Minister of Assam and AASU representatives. No such talk had taken place since 2005. The talk resulted in a 90 point memorandum between AASU and the government. Even after 33 years of the Accord, there are so many points still to be considered. AASU General Secretary Lurin Jyoti Gogoi has said that AASU will oppose any move by the government to grant citizenship to Bangladeshi Hindus as neither the Constitution nor the Accord differentiates between people on the basis of religion. The government has ensured that no such move would take place. The government has promised to update the National Register of Citizens (NRC). A statement issued by the Assam government said that Rajnath Singh has promised that a committee with representatives from the Centre, the state government and AASU would be formed to make sure all the clauses of the Accord are implemented. The erection of fencing across Indo-Bangla border is also in progress. thRadical :Short notes for Competitive exams: ASSAM ACCORD - What all the fuss is about?